29th Anniversary Sale - Come Help Us Celebrate! 29th Anniversary Sale – Come Help Us Celebrate! 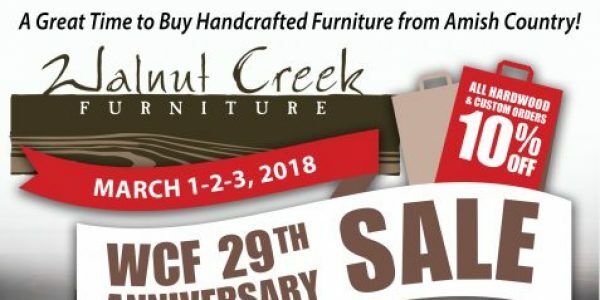 It’s that time again… Come by Walnut Creek Furniture March 1st thru 3rd, 2018, and help us celebrate our biggest event of the year — the annual ANNIVERSARY SALE! If you’ve been contemplating a custom order of Amish handcrafted furniture, or are looking for a unique hardwood piece of furniture, this sale is a great time to shop. The Walnut Creek Furniture showroom features several levels with hundreds of furniture choices—upholstered furniture, bedroom sets, mattresses, dining sets, theater room, entertainment centers, fireplaces, live edge custom furniture, industrial one-of-a-kind treasures, tables, benches, chairs and stools, home decor items including rugs, throw pillows, frames, mirrors, clocks, table linens, glassware, florals, candles, and more. Follow us on Facebook and see some of our unique pieces on display. All hardwoods in the store, and custom orders, 10% OFF. In stock upholstered furniture and mattresses, 15% OFF. Giftware in stock, 25% OFF. Grand prize of a $2000 Walnut Creek Furniture store gift card. Second prize – a Dutchcraft mattress. Third prize – overnight stay at the Wallhouse Hotel in Walnut Creek, Ohio, and dinner for 2 at Der Dutchman Restaurant. Our staff is putting together a great coffee bar and cupcake extravaganza, so be sure to stop in!